There were five King George V class battleships built for the British Royal Navy, the others being Prince of Wales, Duke of York, Anson and Howe. British battleships lacked the size and firepower of rival nations as they were built to comply with the London Treaty limits of 1930. That treaty restricted the size of battleships to 35,000 tons with a maximum of 14-inch guns. After Japan walked out of talks in 1935, word soon spread they had embarked on a program of building battleships far in excess of the treaty limits. Italy, France, Germany and America responded to Japan’s actions by designing battleships with no restrictions. Britain continued with the King George V class as they had by that time committed their resources to the 14-inch gun design. The first success of these ships came when King George V and Prince of Wales were involved in the sinking of the Germany battleship Bismarck. After Japanese forces began threatening British interests in the Far East, Prince of Wales was sent to the area to act as a deterrent. On December 8th 1941, Prince of Wales along with the 26,500-ton battle cruiser Repulse, destroyers Tenedous, Electra, Express and the Australian man o war Vampire set out from Singapore in search of Japanese warships. The decision not to provide this convoy with air cover soon turned out to be a disaster as Japanese aircraft attacked them two days later. As the Japanese concentrated their attacks on the two larger British warships, Repulse was severely damaged by bombs in the first wave of attacks and sank within three minutes of being hit by torpedoes from the second onslaught. The second attack also succeeded in hitting Prince of Wales with one torpedo. As the battleship steamed on while listing to port, torpedoes launched from a starboard side attack hit below her armored belt causing catastrophic damage. A final high-level attack succeeded in hitting Prince of Wales with three bombs before she sank. Although the escorting destroyers were quick to pick up survivors, 840 men were lost with the two ships. The four remaining warships in this class joined the Far East fleet in 1944/1945 to carry out shore bombardment during the final months of the war against Japan. Anson and Duke of York were decommissioned in 1949 with Anson being sold for scrap December 17th 1957 and Duke of York sold for scrap February 18th 1958. Howe was decommissioned in 1955 and sold for scrap June 2nd 1955. King George V was taken out of service in 1950 and sold for scrap January 20th 1958. 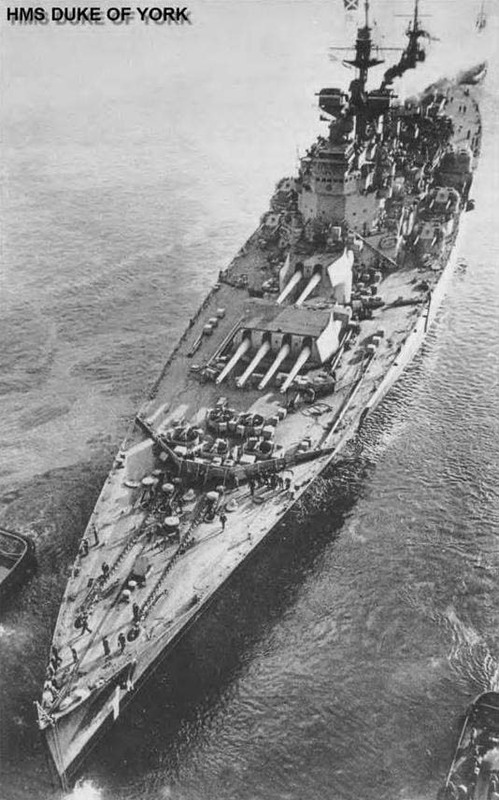 The British had the five King George V class battleships and about 13 WWI era battleships in service throughout WWII. Three were sunk such as the modern Prince of Wales by Japanese air attack Dec 1941, and the WWI era battleships Royal Oak by U-47 October 1939, and Barham by U-331 November 1941. British Dreadnaught Battleship List & Info.